Bed and Breakfast at its very best. 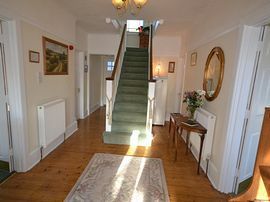 Aquila Heights Guest House is situated in a quiet location within easy reach of Dorchester's historical town centre and all its facilities and amenities. Excellent Breakfast menu, serving freshly cooked to order using the finest local produce in season wherever possible. Ground floor two-roomed suite with full facilities for disabled guests and wheelchair users. Guests are welcome to picnic in our secluded garden and patio whenever weather permits or to bring home a takeway (or have delivered). Guest lounge to relax and unwind at the end of a busy day. Central for touring Dorset's abundance of historical sites, places of interest, gardens, museums and neighbouring towns and exploring our World Heritage Jurassic coastline and beautiful undulating countryside. An ideal location for walking and cycling our hundreds of miles of way-marked footpaths and bridleways. On Sustrans National Cyclist Network's Cycle Route2 and very near Route26. Secure overnight cycle storage and drying facilities. A peaceful night's sleep with just ahort walk into the town centre. Freshly made packed lunches can be available on request. Why not bring your passport and link to France with cycle-west.com for the new Tour de Manche cycling adventure! Free car park for guests plus no yellow line or permit parking restrictions on street parking in this area. Spacious, light and airy en-suite bedrooms. Set in a quiet location with panoramic views. Disabled Facilities: There are disabled facilities. 2 roomed ground floor suite to sleep up to 4 with full facilities for the elderly, disabled and wheelchair users. Level access direct from our car park. Seated level-deck shower en-suite. We now allow guests to bring one well behaved dog with its own bed if guests are staying in our Ground floor suite. We have no pets of our own so the rest of the house is completely pet free. Special Diets Provision: Special diets are catered for. There are several vegetarian choices on our Award Winning Breakfast menu, plus given information a little in advance, we endeavour to cater for even unusual dietary requirements. Smoking Facilities: Smoking is not allowed. Guests are welcome to smoke on the patio and in our enclosed garden. Aquila Heights is easy to find from all directions by following the brown tourist signs for "Maiden Castle", from the A35 Dorchester bypass. Stay on the A35 to turn onto the B3147, at the roundabout junction by Dorchester Town Football Club's Weymouth Avenue stadium. Maiden Castle Road is then the first turning left from this approach road into Dorchester. Aquila Heights Guest House is about 550yds along on the right hand side, on the facing corner of the second turning on the right into Florence Road. Main line Trains from London Waterloo (into Dorchester South Station) and Bristol (into Dorchester West Station) Both staions are 8-10 minute walk to Aquila or 2 minutes by Taxi. Bus and Coach Station at Dorchester South train station. Local town service bus stop is outside Aquila Heights. 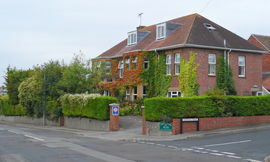 Bus stop for No's 10, 31 and Sureline to Weymouth and No 31 west along the coast to Exeter + other destinations is just a 5 minutes walk away in Weymouth Avenue. Buses for Yeovil, Sherborne and Salisbury etc from Bus station or town centre. 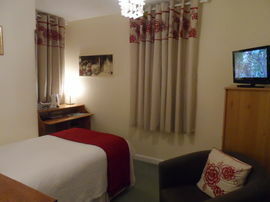 Single Bedroom with private facilities: £45.00 per room per night. 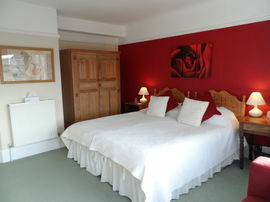 Double or Twin Bedrooms: £74.00 per room per night. Larger, Superior Double or Twin Bedrooms: £84.00 per room per night. 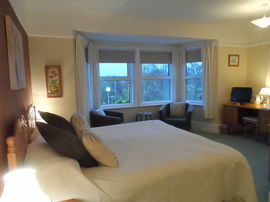 Ground floor 2-roomed Garden Room Suite: from £84.00 per room per night, depending on occupancy - sleep up to 4 guests. Please see our website with our own online availability search calendar for the latest prices for your dates and direct online booking. Aquila Heights Guest House is totally independent. We have no links to or from any of the online booking agencies. Thank you for making us feel so welcome + at home. Amazing attention to detail, choice of toiletries + breakfasts. Excellent service and quality. You really have thought of everthing and more. Joan, Bill and Lesley, Lancashire What a delight to find somewhere that not only caters for the truly disabled but welcomes them! - and, provides for all their needs. We have had a wonderful break. Clean, comfortable rooms and an amazing breakfast! Ruth & Patrick - Cosham, Hampshire We spent a most pleasant four days here-nothing is too much trouble. The rooms are lovely and the breakfast magnificent. June and David - Sydney, Australia Aquila heights is a pearl among guest houses - one's every want is anticipated + so much information to help one's enjoyment. Sue - Ceredigion.